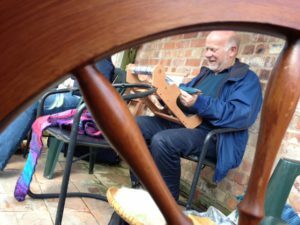 2018 saw a bumper number of events at The Weaver’s House. 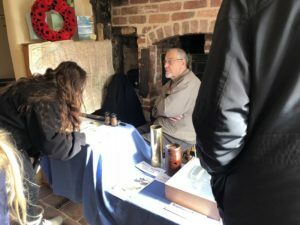 Alongside our usual Open Days, there were not one, but two weekends open for Heritage Open Days plus exhibitions and special events. 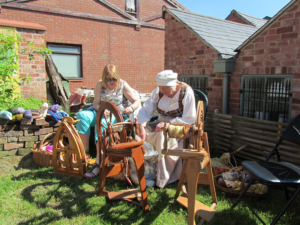 The year started in fine form with a sunny April Open Day and continued into May with a site-wide celebration of medieval crafts, with visitors able to experience traditional skills and talk to craftspeople about their process. June brought a wealth of opportunities to see the house. 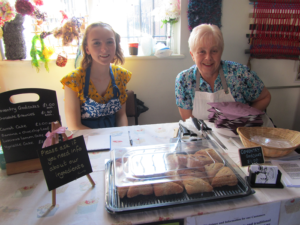 Alongside the usual Open Day, the house opened for the annual Warwickshire Open Studios and Coventry Arts Trail with a display of The Weavers’ Workshop projects. 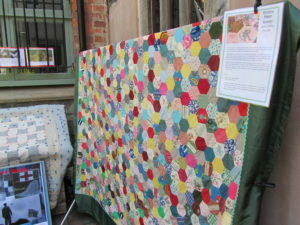 Also part of Warwickshire Open Studios, the house hosted the War & Pieced Patchwork Exhibition, a collection of thought-provoking military and civilian patchwork quilts collected and restored by Jane and Peterson Cobbett. Visitors to the exhibition sat in the garden enjoying a gloriously sunny day, with little realisation that the beautiful weather was to signal the start of an unforgettably sunshine-filled summer. 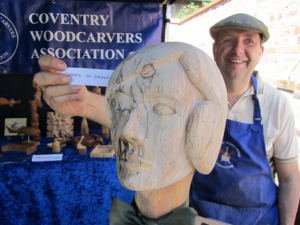 The sun stayed through July’s day of Tudor-styled fun featuring games both familiar (such as quoits) and less recognisable (Nine Men’s Morris) and into August’s Family History Day. This themed day celebrated the lives of people who had lived in Black Swan Terrace, the group of cottages that The Weaver’s House is part of. 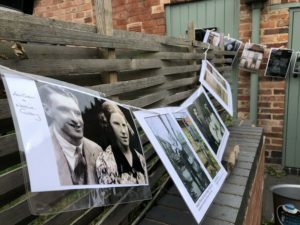 We were delighted to welcome families of former residents of all five houses, and visitors were even able to research their own family history. 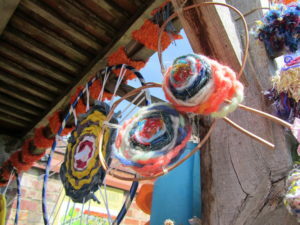 September saw Spon Spun return with participation by The Weaver’s House on the Arts Trail. 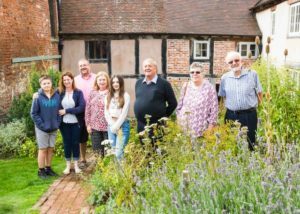 Plus two sets of Heritage Open Days, a first for the festival itself and a sure indication that interest in the past has a good future! Another first was our special Halloween Open Day in the October half term. 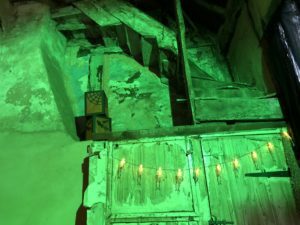 Volunteers transformed the house into a spooky and entertaining setting for a day of crafts, treats and storytelling. 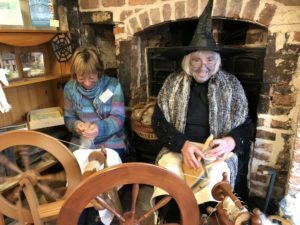 Despite it being a cold day, much fun was had and visitors were able to warm up with mulled apple juice, hot chocolate and Halloween themed tasty treats. 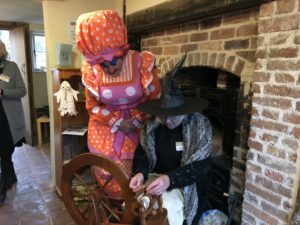 The Belgrade’s panto dame, Nanny McWheeze, popped in to learn a little about spinning wheels and spindles, in the hope of protecting Princess Belle from the curse of the wicked Carabosse! 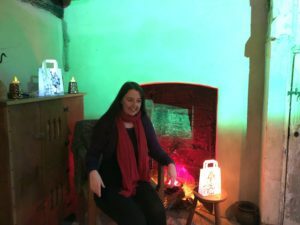 The day finished with a special storytelling session in the house itself, with storyteller Pyn Stockman enchanting both children and adults with the tale of Vasilisa the Brave. 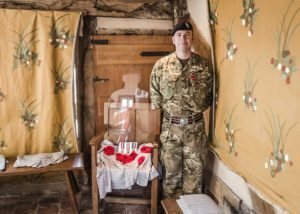 In November there was a special event to mark the 100th anniversary of the Armistice for which The Weaver’s House was awarded two There But Not There silhouettes funded by the Armed Forces Covenant Fund Trust. 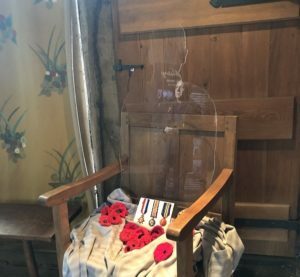 These silhouettes were in remembrance of former residents, the two O’Neil boys posted to France during WWI and who did not return. 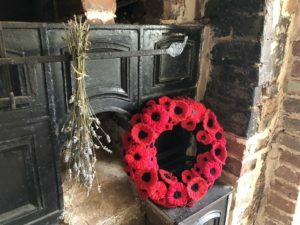 One of the volunteers, Clare, is a descendant of the O’ Neils, and she put together a special talk including the war story of the family, which was completely fully booked. 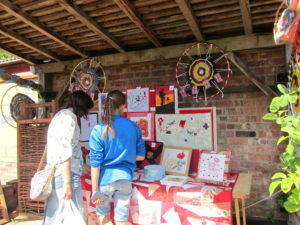 Visitors helped to create a memory board and the house was decorated with woven poppies created by The Weavers’ Workshop. 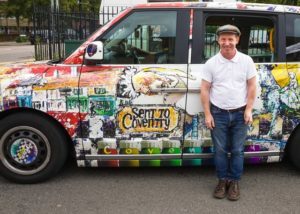 The volunteers were joined by Sergeant Phil Edis of Coventry R.E.M.E. 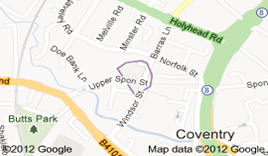 (Royal Electrical Mechanical Engineers) to represent the Armed Forces in our community today. 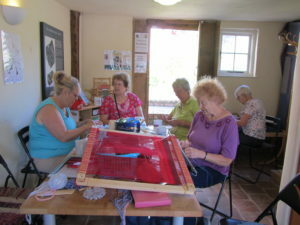 The finale of the year was another new venture for The Weaver’s House, as a venue for craft workshops. What a busy year! 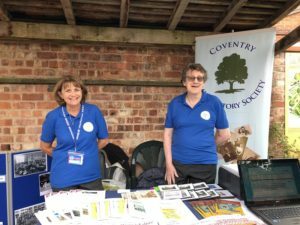 If you would like to find out more about any of the events from the past year, have a browse through our blog. 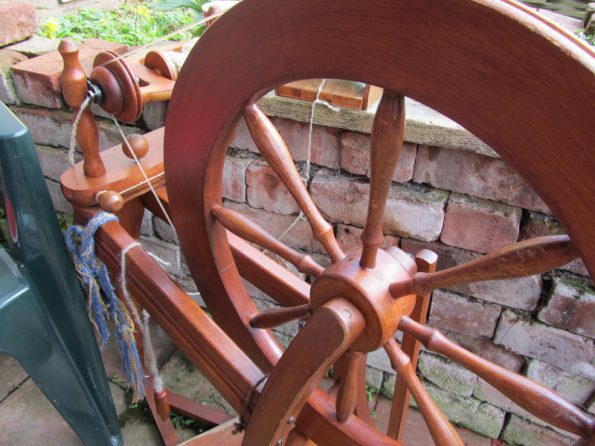 Open Days at The Weaver’s House will recommence in the springtime, and details are here.